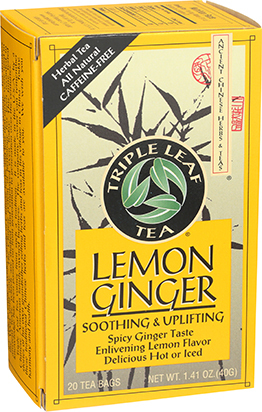 Enjoy the delicious spicy taste of ginger combined with smooth and tart lemon flavor for a delightful, soothing and uplifting tea. Gain the benefits of ginger and flavorful herbs in this zesty and enlivening tea. It is refreshing and awakening without any caffeine. It’s a perfect tea for any time of the year. It is comforting and warming when it is cool, and refreshing and invigorating when it is warm. Ginger has been used in China since the 4th century B.C. Ginger was a popular beverage, traditionally consumed with meals and at other times of the day. It is said that the Chinese scholar Confucius had ginger nearby at every meal. It was regarded as a tonic for yang “chi”, or energy, and was a favorite infusion during the cold and chills season. Enjoy it as is, or try adding honey or your favorite sweetener. It is delicious hot or iced. For the full spicy ginger and lemon flavor, pour boiling water over the tea bag, squeeze gently, and let steep 10-15 minutes, or longer. Leave the tea bag in the cup and squeeze gently again before enjoying. Try it along with our Ginger Tea for even spicier ginger flavor or any of Triple Leaf Green, Decaf Green, White or Oolong Teas for a delicious alternative. HOT TEA: Pour 1 cup boiling water over a tea bag. Squeeze gently, let steep 10 – 15 minutes or longer, leave the tea bag in the cup and squeeze gently again. ICED TEA: Pour 1 cup boiling water over 2 tea bags. Squeeze gently, let steep 10 – 15 minutes or longer, squeeze gently again, remove the tea bags, then add ice. For stronger flavor, simmer a tea bag in a cup of water for 5 – 10 minutes, squeeze gently and leave tea bag in tea. We recommend re-using the tea bag to extract more ginger taste.